Your mouth wouldn’t be complete with your tongue. Tongues help us experience the taste of the world and express our experiences to the world by helping us speak. We all know how to use our tongues, but not all of us know everything about them. Can you imagine living without one? That would be unspeakable! Your tongue needs caring as much as your teeth and gums. After all, it’s part of your mouth, and therefore also gets filthy from all the food, drink and whatever things you put on it. Because it is used constantly, your tongue, which is covered in papillae, the little bumps on its surface, traps germs and harbor a variety of bacteria species on it. These nasty organisms on the tongue can cause bad breath and even affect you sense of taste. Furthermore, overabundance of bacteria may discolor your tongue, turning it white, yellow, or black and hairy-looking. Yuck! Make it a habit that you include your tongue each time you do your brushing and try to reach until the back. It may trigger a gag reflex, but it will ease up in due course. Because the mouth is already loaded with germs and bacteria, the risk of tongue piercing or lip piercing infection is higher in this area than on any part of the body. Plus, the act of tongue-piercing itself is known to damage the nerves of your tongue causing an altered sense of taste or permanent drooling. If you are still intent on having your tongue pierced, make certain that your dentist has informed you of ways on how to manage them to avoid any possible complications and that you let an experienced artist do it for you. Similar to a finger imprint, your tongue is one of a kind. No other tongue in the world has the same imprints as yours. How fascinating is that? No matter how much a person eats or talks throughout the day, the tongue doesn’t seem to hurt from exhaustion. The tongue also impresses us with its unmatched flexibility. The majority of us live with a tongue that is about 10 centimeters long from the inside all the way to the tip. A special few individuals have tongues with incredible lengths. For instance, Guinness World Record for the longest tongue holder, Nick Stoeberl sticks his tongue outside of his mouth to a length of about 10.1 cm meaning that this part of his tongue is longer than the average whole tongue. Your tongue color can indicate serious health issues; unless the color goes back to enjoying colorful candy. A good tongue would be pink. Infections and allergies can change a tongue’s color to red and make it swell. If the redness comes with sore throat and fever then you might need a check-up. Some blood pressure and allergy medications may reduce saliva production and so cause the tongue to blister. Fungal infections like thrush result in white patches on the tongue and can be treated with antifungal medications. If you don’t ingest enough nutrients such as vitamin B12, iron and folic acid, the tongue would indicate that by being too smooth. See those small white and pink bumps on your tongue? Those are called papillae and they are not your taste buds but they are where the taste buds reside. One of the most misleading illustrations about the tongue is the one dividing it into regions specified for different tastes. There is no place specific for tasting sour, sweet, bitter or salty tastes. You can make a simple experiment by sprinkling some salt on tip of your tongue and find out that you can taste it although this spot is said to taste sweet tastes only. The rolling or curling of the tongue is an ability that only some have. 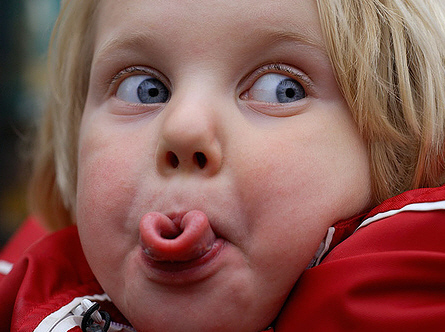 Science school books mention an individual’s ability to roll their tongue as an example of an inherited trait. Genetic experts say that this ability is not only genetic as there is essentially an environmental factor contributing to this wonderful trick. The evidence that support the existence of an environmental influence is based on a child’s ability to learn how to roll their tongue even if they couldn’t do it in the first place.